Orangeburg, S.C. – It’s all about increased satisfaction for customers and more revenue for businesses. 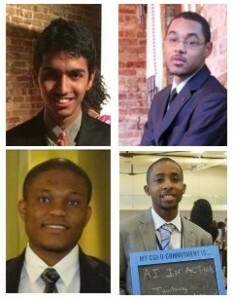 Claflin University students Sakshyam Dahal (Upper Left), Michael DeVore (Upper Right), Ifeanyi Kalu (Lower Left) and Eddie Massey III (Lower Right) are finalists in the United Athletes Foundation’s Be “U” Hackathon League Series Competition with their new mobile app concept, Live Chair. The team is one of 12 finalists nationwide and will present the concept at Microsoft headquarters in Redmond, Wash., November 12-14, 2014. The grand prize is $10,000 per team member. The Claflin team will be competing against student teams from Clark Atlanta University, Fort Hayes State University, Hampton University, Howard University, Lincoln University, Morehouse University, NC A&T University, New Jersey Institute of Technology, Old Dominion University, Spelman College and the University of Washington. The UAF’s Be “U” Hackathon League is designed to leverage the talents and resources of the emerging minority collegiate community to enable students/entrepreneurs to create innovative technologies. These diverse collegiate student teams have the opportunity to create innovative apps with the support of advisors and mentor-coaches comprised of technology industry leaders. Teams compete for scholarship prizes and the opportunity to showcase the winning teams’ concepts to industry executives. Team leader DeVore said he learned about the competition this summer from one of the founders of the program. “Sometimes, if you go in the evening time, there might be a line of 20 people waiting ahead of you, and you’ve already wasted your time and your gas money to go down there, so you’re frustrated,” DeVore said. “You don’t know which time to go, and the barber, at certain times of the day, might get one customer per hour. That’s not fully maximizing the efficiency of their barbershop chairs. DeVore had the idea for Live Chair months ago, but the Be “U” Hackathon competition gave the team a reason to act on it now. DeVore’s Be “U” Hackathon teammates most recently were part of the four-person team of Claflin students that placed second in Rural Sourcing Inc.’s annual RSI Westobou Hackathon during the Westobou festivities October 3 in Augusta, Ga. Dahal, Kalu and Massey were joined by Orlando Watson to compete against teams from Georgia Regents University, Augusta Technical College, University of South Carolina-Aiken, Aiken Technical College, Georgia Southern University and Paine College. The teams were given four hours to develop a custom web application. There is a lot of initial interest from local barbershops wanting to be the first to use the Live Chair app, DeVore said, adding that so much can be done with it beyond just filling empty barber chairs. He said advertising geared toward individual customers’ needs would be another useful tool for both barbers and their clients. DeVore was also the driving force behind the team that won Claflin’s inaugural Entrepreneurship Business Competition in the spring. InstaPrintz, now InstaPrinture, is a program that would allow users to print anywhere at any time using their smartphones sans a printer. Judging the Be “U” Hackathon competition will be key members of the UAF, Microsoft, U.S. Hispanic Chamber of Commerce, U.S. Black Chamber of Commerce, and Asian/Pacific Islander American Chamber of Commerce & Entrepreneurship. The event is supported and sponsored by the Microsoft Supplier Diversity program. UAF has partnered with Tom Chikoore, an experienced entrepreneur and founder of the TechStars RisingStars Program to extend technology startup opportunities to underserved entrepreneurs. But Live Chair could also use Claflin University and surrounding community’s help. The team is busy collecting data to include in its presentation. Tweet about your worst barbershop haircut and beauty salon experiences using the hashtag #LiveChair @LiveChair. More information about Live Chair is also available at http://www.instaprinture.com/live-chair/.